Working in the textile art of latex wardrobe creation, we tend towards involving ourselves—as much as possible—in both the ‘pop’ world as the quickening blush of the latest technologies. As you read in this blog often we will as much opine on the latest video from a Nicki Minaj, the new Captain Marvel suit or something like the Bauhaus movement celebrating its 100th anniversary this year (the very subject of the nest blog you will see here). It’s impossible of course to catch it all, and we realize our reporting and opinion goes out to the great noisy wash as all postings do. But among making our latex dresses when something comes our way of interest or we are part of a magazine shoot or T.V. show, we do like to reveal it. Considering the above, we were (as it seems everyone else was) blown back on our heels over the audacious modern artistry (audacious in a good way) of last Saturday night’s Fortnite concert. 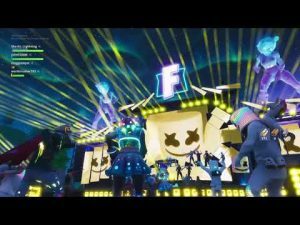 The game’s “DJ Marshmello” treated more than ten million gamers as well as who knows how many more millions streaming in, to a blistering ten-minute set. Huge holograms of the game’s many characters appeared, while the blistering kinetic dance music issued forth. Gravity seemed a variable element at best as players could bounce any which way and those dancing emotes had a grand old time in and around the stage. To be sure this was not the first in-game live show. Still, Marshmello’s concert was an unprecedented explosion of light and sound. There was also a special game mode for the concert, in that players could ‘respawn’ if taken out by an enemy during the ten minutes. Weaponry was disabled during the ten minutes too, and there was also bonus buying for Fortnite fans of Marshmello’s skin for around $15.00 and special Fortnite dance emotes. The real world or cyber, digital or analog, smart wear or a good old cotton blend, if whatever it is you see, work with, wear or taste moves you, then have at it we say. Fortnite was more than its usual good time last Saturday night, and millions and millions seemed to notice.